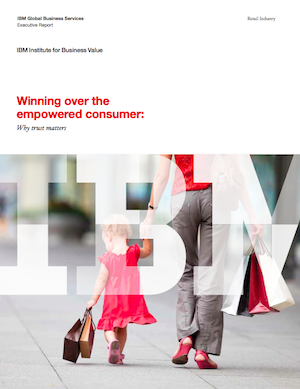 IBM’s 2012 study of retail customers in eight mature economies (Australia, Canada, France, Italy, Japan, Spain, the UK and the USA) and seven growth economies (Argentina, Brazil, Chile, China, Colombia, Mexico and South Africa) lays bare that the retail “shopping” experience has shifted profoundly, although you wouldn’t know it by looking at most offline or online retailers’ presences. The paper, “Winning over the empowered consumer: Why trust matters,” is a call to action for physical and online stores to shift away from impersonal, mass merchandising approaches to individualized interactions and service. How Social Changed Retail is first in CSRA’s retail & omni-channel series. It shares my insights from several years of social business transformation client work as a context for referencing highlights of the IBM research, which underlines some of the concepts with research findings. Disclaimer: of course, “ecommerce” and omni-channel are relevant to a wide range of firms; the remarks here are focused on B2C-oriented retail and ecommerce. That said, many of the premises will apply to B2B businesses as well, but somewhat differently. IBM’s work is unusually valuable because it begins with the customer, not the retailer, the brand or the product. Virtually all the thought leadership I’ve seen about “empowered customers” goes skin deep, being satisfied to note social media activity and to overlook the role of trust in changing the game. CSRA’s client work since 2006 has been focused on guiding firms and brands on interacting in digital social venues, so they increase trust. Consequently, I have first-hand experience with how citizens and “customers” of government, hightech, big box retail, financial services, nonprofit and others act online and how their expectations are changing. Customers using social technologies have changed their own experience with “shopping” and thus changed the retail playing field. Their interactions among each other online are personal and individualized, and groups of online customers usually have superior product knowledge than anyone at retail locations to whom customers have access. This driver was implied in IBM’s research and borne out in its findings, but it wasn’t explicitly stated. The boutique or neighborhood store of the 1950s knew its customers personally and often provided specialized, personal advice, but few customers have experienced that kind of service in years. In those days, customers might even engage the retailer in step1, or certainly in step2, because they trusted the people in the store, and those people were knowledgeable about what customers were trying to accomplish. In general, since then customers traded personal service for lower prices. From the 1970s to the early 2000s, retail customers as a group engaged the retailer later and later in the journey. They use the Internet and social networks, so they only interact with retailers in step4 or step5, where they receive relatively uninformed, impersonal advice and consider a baffling array of products, pricing and promotional variables. By the 2000s the retail store had obviously become a depot. 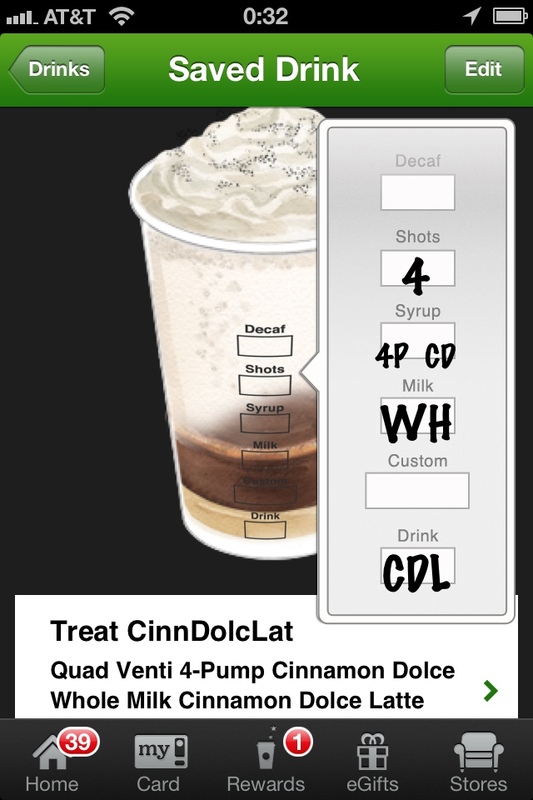 Retail customers increasingly used digital social venues for step1-step4, and they got support in step7-step9, so the retailer was only needed for two of the nine steps. It should be obvious that the retailer’s influence on purchase is minimal in isolation of the other steps. Step1-step4 determine which retailers are even considered. It’s also no surprise that retailers compete mostly on the four Ps, which is a very red ocean and getting redder fast. It’s a direct route to commoditization. By the way, very few brands seriously consider step7-step9, but it is where the rubber meets the road—it’s where the customer gets disappointed or fulfilled. Most retailers approach post-purchase “customer service” as a cost center, and that’s killing their reputation, trust and profit. They are focused on selling product and want to minimize what follows the sale—unless they charge for aftermarket services as many B2B firms do. Retailers have a rare chance to make their interactions with customers much more relevant and rewarding, but that path is blocked until they bridge the Industrial Economy producer/consumer divide. Mass production and distribution have created a profound split between producers and consumers. Here’s a quick overview. Producer view: Mass production meant finished inventory that had to be “sold” and begot marketing. Producers’ main value lever was efficiency, and they applied it to every aspect of their businesses. Consumer view: People only buy products and services for the outcomes they can create. Very few consumers like products as much as producers do. The product is a cost to the consumer and revenue to the producer. Customers use products and services as tools. People buy holes, not drills. Prior to social technologies, neither firms nor people knew much about outcomes, so customers did the best they could to create value by using products and services, but much of the potential value was wasted. For one example, roughly 90% of smartphone features are unused or minimally used. By digitizing “sociality,” social technologies have exploded the amount of outcomes information that includes the social context in which products and services are used. Moreover, people mirror and educate each other in their quests to have the best outcomes possible when using products and services. The stage is set for firms to create “post-product relationships with customers.” Firms can directly address the value that customers are trying to create by using their products, and social technologies make collaboration too cheap to meter. I have seen the producer/consumer divide in every sector during my analyses of thousands of digital social interactions. Moreover, digital social venues have amplified the divide because firms, by continuing their focus on product, appear irrelevant or, worse, uncaring, to people. Customers have changed each other’s expectations about interacting online, and the divide is widening. Firms that think different about differentiation will collaborate with customers and differentiate by helping customers in public to achieve fantastic outcomes in situations in which firms’ products/services are relevant. The willingness to “think beyond the product” will define who thrives and survives. Differentiation is proven by serving people in the social channel where users control the conversation, not firms. IBM’s survey of 28,000 retail users in fifteen countries confirms that “customers” will award loyalty to the few firms they trust. IBM did not reference Apple, but it is a common example of the loyalty trend. Some marketers call Apple a “lifestyle brand,” but that doesn’t fully capture the loyalty that people give to Apple, and how the company earns that trust by how it treats users: in stores, on the phone, online, and through its superior design of software and devices. That’s omni-channel. There is nowhere to hide: people know everything about a brand, its ingredients, its suppliers and apps even exist that automatically show brands’ corporate affiliations. For example, Buycott makes it easy to blacklist brands allied with Monsanto. This trend is accelerating. There is an app for that. Customers aren’t waiting; digitally connected people serve as accelerators for each other. Firms and brands that are first to engage customers by providing personal individualized experience will outperform. Laggards will disappear unless they are efficiency leaders. That means beating Walmart. New startups and pureplays begin by focusing on user outcomes, and they enlist users to help design, deliver and service products and services. Two examples are Betabrand and Threadless; on another front, 3D printing will bring a similar disruption to physical products as “the Internet” brought to media and entertainment. Real-time global supply chains and socially powered mass customization will enable an explosion of creativity and experimentation. Firms require significant learning curves when they want to “engage” users on digital social venues. Up to now, most have practiced social media, which focuses on product promotion, not collaboration and outcomes. Collaborating with users on behalf of firms is very difficult for agencies, so outsourcing will be of minimal use to firms that want to adopt quickly. Agencies’ core competencies are grounded in content creation and distribution; they rarely have much insight into how users use products and services. I have been chief marketer three times, so I understand many aspects of “marketing.” My intense analysis of digital social interaction leads me to predict that current “marketing” and “selling” models are destined for the dustbin. Too often, stereotypical sales and marketing impose on customers because firms have to move product or sell more services, and they see “customers” as consumers, not people. They put firms first. Conversely, firms that trust users and serve them by helping them achieve high priority outcomes will adopt a totally new attitude toward “marketing.” It will be grounded in respect and trust that customers and their friends know when to use products and services; pushy salespeople rapidly destroy trust because their agenda is to sell. However, when products and services are introduced honestly in the context of customer outcomes, customers welcome them because the firm puts the customer first, not itself. Firms that do this increase trust and sell more at higher margins. “Smart consumers” or “connected consumers” use social technologies to share, collaborate and advise each other—and they celebrate victories and console losses together. They know all there is to know about product features, pricing, servicing and other “differentiating” features of mass-marketed products and services. Marketing organizations still try to differentiate on product features, which is less and less effective because it doesn’t address outcomes, it’s product-focused. Driving all of these changes is the fact that “connected consumers” have the Internet, their friends and their social networks in their pockets, and they consult them as a core part of their decision journeys. Mobile adoption is pervasive, even in mature markets, which have lagged emerging markets until recently. Moreover, users are “frugal but willing” to spend more, especially when they trust the firm whose products/services they are considering. IBM found that frugality prevailed globally across markets, but “trading up” was common in all markets, given the right conditions, one of which was trust. Depending on the firm’s business, it may have numerous transactions and transaction types with customers, and firms that learn to capture, organize and deliver customers’ data in ways that help them achieve outcomes more easily can add serious value, create stickiness and reduce churn. “Big data” organizes and analyzes unprecedented depth and breadth of data from individual customers and ancillary data to find correlations that help the firm increase relevance to customers. Moreover, IBM’s research suggests that customers in mature and growth markets increasingly expect firms to have and use relevant data to personalize their interactions. 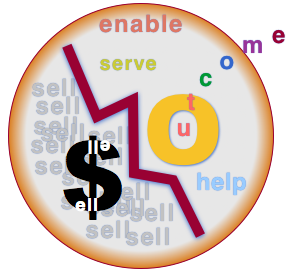 (R)etailers can create a virtuous cycle when their use and delivery of data adds more value to users. By remembering preferences, users’ desired outcomes, post-purchase servicing history and the like, firms can increase relevance and decrease the friction of additional interactions. As virtually connected as survey respondents were, they still said that physical stores had enormous appeal. Although this certainly varies by situation and product, a strong majority preferred to buy in stores. Physical locations engage most of a person’s senses and awareness, so bricks and mortar stores can be visceral experiences, but retailers have to reimagine physical stores as experiences to delight the senses and quench customers’ desire for trusted care. Products are there, but the goal is trusted care. 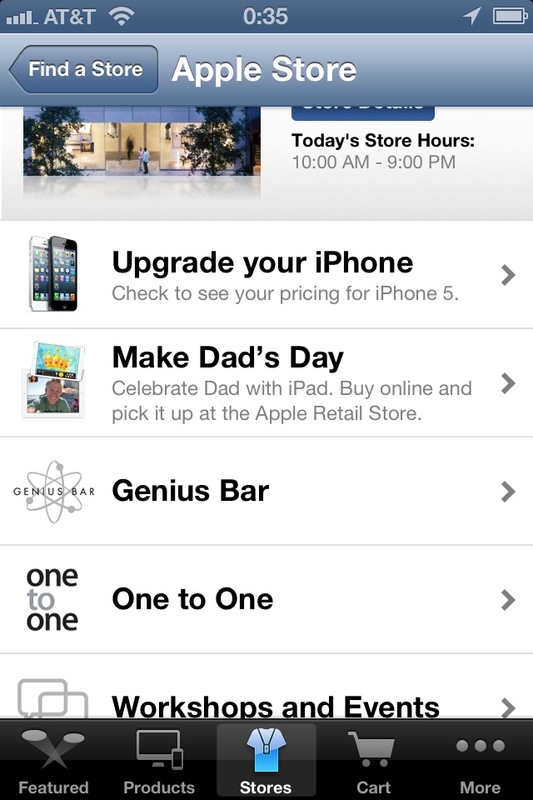 I see Apple stores as one example. I observe intently how “associates” treat people and how people respond. I have repeatedly seen that rewarding experiences, care, can change customers’ overall feeling of wellbeing. Why? It is so rare to be sincerely listened to and cared for, even in a small way. This is so human, but retail has become dehumanized in the pursuit of profit-through-efficiency. IBM found that when firms empower store associates to serve customers more meaningfully, that increases trust and satisfaction. In other words, firms need to enable customers to show the results of their research to store associates to use for in-store collaborative discussions. The biggest barrier to adding value in the store may be firms’ ignorance of customer outcomes and appreciation of customers’ decision journeys. Firms need to reimagine stores to add unique value while recognizing that “moving product” adds little value in itself; the customer can get the product anywhere. IBM’s research makes clear that personal individualized experience will be key to success, so each firm needs to use social technologies or other means to get far more intimate with their customers so they can increase relevance in appropriate ways. Omni-channel refers to firms organizing and integrating information, systems and functionality to enable customers and partners to interact with the firm in the most convenient way; however, firms that pursue it without bridging the producer-consumer divide will underperform. IBM astutely put “trust” in the title of the paper. Trust is the way to bridge the divide, by joining customers in their pursuit of exceptional outcomes, in the social channel. Together, omni-channel and crossing the divide represent the biggest opportunity in retail since mass-merchandising. Firms can approach them as offensive leaders and remake markets. Other firms will not survive unless they provide far more personal individualized service than is the norm today. This is far from being a trivial proposition, but the market will take no prisoners. Many firms and brands will disappear, as always happens with profound disruptions. The Ecommerce Competency Center at the Chief Digital Office has links to the best resources I know. 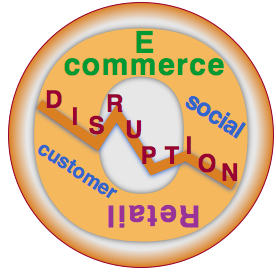 IBM’s research strongly suggested that the “connected customer” experience and impact on retailers are global phenomena. As such, it is a call to action that firms should heed strongly. Customers have remade retail, even though they probably aren’t aware of it. Retail executives don’t understand this because they aren’t accustomed to thinking of customers as collaboration partners. Customers don’t really care about remaking retail; they want better outcomes, more consideration, individual attention and less friction from retailers. Imagine that you are asked to describe bike riding to a visitor from the moon. You would probably find it to be very difficult; you would have to explain things like gravity, which gives the context to “balance.” Exceptionally few executives have any appreciation for the widespread and profound customer collaboration that is occurring online. They can’t understand without feet on the ground, serving, not selling. They need to—it’s the key to crossing the divide and realigning with customers.